The DVD rental giant could be exploring a spinoff or outright sale of the business. What: Redbox DVD kiosk operator Outerwall's (NASDAQ:OUTR) stock spiked nearly 19% in March, according to data provided by S&P Global Market Intelligence. The boost removed some of the sting for shareholders who have seen their investment cut in half over the last year as the company struggled with sharply declining DVD rentals. 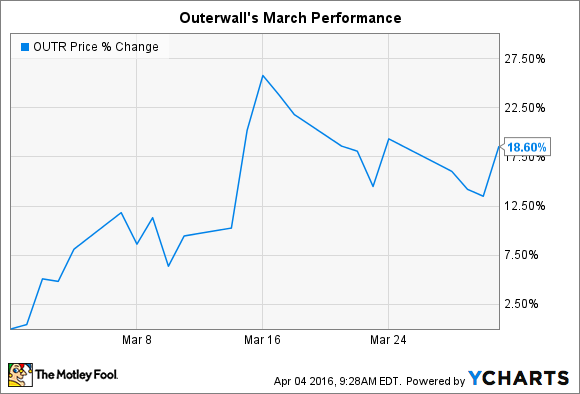 So what: Two key pieces of news combined to make for a good month for Outerwall's stock price. First, the company announced on March 14 that management has started a process to "explore strategic and financial alternatives to maximize shareholder value." In plain English, that means Outerwall is looking into fundamental financial changes that could include spinning off portions of the business or even selling the entire enterprise to a larger media company or private equity group. The company at the same time doubled its dividend to $0.60 per share, pushing its annual yield to over 6%. Next, news broke later in the month that Outerwall is considering launching a digital service for movie rentals to extend its reach online following its failed Redbox Instant experiment. The new attempt reportedly won't aim to replicate Netflix's (NASDAQ:NFLX) all-you-can-stream subscription model, as Redbox Instant did, but instead will offer on-demand rentals in the surging market for digital entertainment. Now what: With activist investors pressing management for major changes amid a languishing stock price, it's possible that Outerwall will announce major news in the coming months -- up to and including a potential sale. Those rumors are no basis for an investment thesis, though, and so shareholders will be looking for evidence that the company has an answer for the fact that its core market, DVD rentals, is quickly shrinking as customers' entertainment spending moves online. It is set to post its quarterly results on April 28, and consensus estimates call for a 17% sales slump as earnings dive to $1.33 per share from $2.87 per share in the year-ago period.